Research on subjective well-being has shown that there are geographical differences in well-being. Drawing on theory and research in social-personality psychology, economics, and geography this chapter reviews research concerned with the geographical distribution of well-being, and how individual characteristics, social institutions, and the physical environment influence that distribution. Findings from several studies conducted at multiple levels of analysis strongly suggest that selective migration, social influence, and ecological influence are key mechanisms responsible for the geographical clustering of subjective well-being. Cross-national studies and analyses of regional differences in the U.S. indicate that the average level of subjective well-being in geographical areas is related to a range of economic, social, and health indicators. Moreover, evidence suggests that personality traits interact with features of the environment to influence individual differences in subjective well-being. More work is needed to understand the causal nature of the relations between subjective well-being and the macro environment. For decades, psychologists have been concerned with understanding the relations between the environment and psychological health. Through the years, countless studies have investigated how features of the social and physical environment affect various indicators of mental health, from depression to happiness. Although that work has proven to be immensely valuable to our understanding of well-being, researchers’ conceptualizations of the environment have typically been rather narrow and focused on proximal environmental features. Consequently, considerably less attention has been given to the impact that macro-level factors may have on well-being. However, a growing body of research that conceptualizes environments in terms of geographical units is beginning to broaden our understanding of the links between the environment and psychological well-being. The relevance of geography for understanding social and behavioral processes has long been recognized by geographers, political scientists, economists, sociologists, and epidemiologists. For example, political scientists often examine geographical variation in polling data and their relationships to demographic, educational, and economic indicators (Heppen, 2003; Hero, 1998); macro-economists investigate geographical variation in labor statistics and how they relate to income, migration flows, and human capital (Krugman, 1991; Martin, 1999); and epidemiologists study geographical variation in rates of disease incidences and their associations with demographic, lifestyle, and economic indicators (Borhani, 1965; Glymour, Avendaño, & Berkman, 2007; Lanska, 1993). What is abundantly clear from research in those fields is that people’s values, aspirations, and health are strongly related to features of where they live. It therefore seems reasonable to expect geography to add to our understanding of subjective well-being. Indeed, a great deal of interest has emerged over the past few years concerned with geographical variation in psychological phenomena and how that variation relates to various macro-level indicators (Rentfrow, 2014). Much of the research in geographical psychology is concerned with mapping the spatial organization of psychological characteristics, identifying the mechanisms responsible for their organization, and understanding how the spatial organization of psychological characteristics relate to political, economic, social, and health variables. This chapter reviews research concerned with geographical variation in well-being. Subjective well-being is a psychological construct that reflects a person’s cognitive and affective evaluation of the quality of their life (Diener, Suh, Lucas, & Smith, 1999; Diener, Lucas, Schimmack, & Helliwell, 2009). Because it is based on people’s subjective perspectives, it can be measured easily and reliably using self-report measures, and scores on such measures can provide valid information about the extent to which people find their lives enjoyable, rewarding, and positive overall. The bulk of research on subjective well-being aims to develop an understanding of basic human functioning. Indeed, research on subjective well-being has greatly informed our understanding of the ways in which social, economic, and psychological factors interact to influence well-being. For example, subjective well-being is positively associated with income, productivity, sociability, and physical health (Lyubomirsky, King, & Diener, 2005). Although most research on subjective well-being has examined individual-level processes, researchers are beginning to examine how it plays out at broader geographical units of analysis, such as nations, states, counties, and cities (Diener, Helliwell, & Kahneman, 2010; Lawless & Lucas, 2011; Lucas, Cheung, & Lawless, 2014; Oswald & Wu, 2010; Plaut, Markus, & Lachman, 2002; Rentfrow, Mellander, & Florida, 2009). Interest in the geography of well-being is based, in part, on developing an understanding how local and national culture, society, politics, and economics might feed into people’s subjective evaluations of life quality. There is value for psychology and economics researchers to examine such issues because it can reveal distal causes of subjective well-being, and there is also value for policy makers who could use such information to guide decisions about policies. To that end, researchers have begun to examine geographical variation in subjective-well-being by measuring individual differences in subjective well-being using very large samples of people from around the world. The level of well-being in a place (i.e., nation, state, county, or city) is typically based on the average subjective well-being score derived from a sample of people who live in the same place. Thus, to say that the state of Utah is high in well-being means that the average level of subjective well-being taken from a sample of people who live in Utah is high compared to the average level of well-being in other states. In this way, researchers are able to make comparisons of well-being between geographical regions. And the evidence indicates that well-being is not uniformly distributed, but geographically clustered. A considerable amount of research on geographical variation in subjective well-being has been done at the national level (e.g., Inglehart & Klingemann 2000; Lynn & Steel, 2006; Steel & Ones, 2002; Veenhoven, 1993). Findings from international studies consistently reveal mean differences in subjective well-being across nations. For instance, results consistently show that residents of Canada, Denmark, Switzerland and the US score near the top on measures of subjective well-being whereas residents of Eastern European and African countries score near the bottom (Diener, 2000; Veenhoven, 1993). National variation is not the only way to examine geographical variation. Within many nations, including the U.S., there is considerable variation in the social, economic, and political landscape within the country. Thus, mapping regional variation within nations has value for further understanding the nature of subjective well-being and the factors that affect it. Figure 1. Statewide differences in subjective well-being. Source: Rentfrow, P. J., Mellander, C., & Florida, R. (2009). Happy states of America: A state-level analysis of psychological, economic, and social well-being. Journal of Research in Personality, 43, 1073-1082. 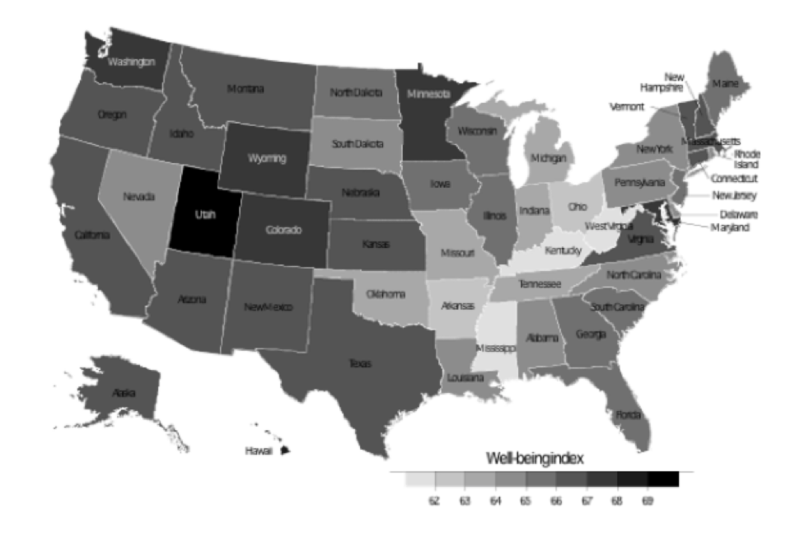 Using well-being data collected by the Gallup Organization, Rentfrow et al., (2009) investigated regional variation across states throughout the U.S. The results shown in Figure 1 display the state-wide well-being differences reported in that research. The map of state-level well-being clearly shows that well-being is not uniformly distributed across the country, but geographically clustered. Specifically, states in the mountain and west coast regions scored highest in well-being. In fact, most of the states that ranked in the top-half on well-being were from the mountain and west coast regions. Well-being was comparatively lower in states along the east coast, and well-being was lowest in states in the Midwest and deep south. Figure 2. Map of county-level life satisfaction across the United States. Counties in white have no data; darker shades of gray reflect higher levels of subjective well-being. Source: Lucas, R. E., Cheung, F., & Lawless, N. M. (2014). Investigating the subjective well-being of United States regions. In P.J. Rentfrow (Ed.) Geographical Psychology: Exploring the interaction of environment and behavior. American Psychological Association. Many states in the U.S. are large and diverse. For example, California, is home to approximately 40 million people, with six cities with more than 500,000 residents and 286 towns with fewer than 1,000 residents. Thus, it is useful to consider whether well-being varies at even more granular geographical levels of analysis. Using data from the Behavioral Risk Factor Surveillance System, administered by the Centers for Disease Control and Prevention, Lucas et al., (2014) examined regional variation in well-being across roughly 2,400 counties in the United States. The county-level maps of well-being are displayed in Figure 2. Although the data source is different to the one used by Rentfrow and colleagues (2009) to map state-wide well-being, the geographical pattern appears very consistent. Indeed, high levels of well-being appear clustered in the mountain and west coast regions, and low levels of well-being appear in the Midwest and in many counties in the south. Furthermore, close inspection of the map shows considerable variation within states. For example, both Texas and California have counties that score very high and very low in well-being. In summary, there is compelling evidence from a number of large-scale studies that subjective well-being varies between nations, states, and counties. These findings are important because they strongly suggest that features of the environment may contribute to people’s levels of well-being. However, understanding how the environment may influence well-being first requires consideration of how geographical variation in well-being emerges in the first place. What are the causes responsible for geographical differences in well-being? What are the Mechanisms Responsible for Geographical Variation in Subjective Well-Being? Recent work in geographical psychology has identified three mechanisms that could contribute to geographical differences in psychological characteristics. Selective migration is one mechanism. Drawing on interactionist theories, which posit that people seek out environments that satisfy and reinforce their psychological needs (Buss, 1987), selective migration assumes that people selectively migrate to places that satisfy their needs. Research on the links between personality and migration decisions indicates that people high in Openness are likely to move away from their home state to a different state and that people high in Extraversion are likely to migrate and that residential mobility has adverse health consequences for people low in Extraversion (Jokela, 2009; Jokela, Elovainio, Kivimäki, & Keltikangas-Järvinen, 2008; Oishi, 2010; Oishi, Miao, Koo, Kisling, & Ratliff, 2012; Oishi & Schimmack, 2010; Rentfrow, 2011). In addition, work by Lucas et al., (2014) indicates that U.S. counties where residents are high in subjective well-being experience significantly higher levels of population growth compared to areas where well-being is low. Although the causal nature of the relationship is unclear, it raises important questions about what it is about places undergoing high in-migration and where residents are high in well-being. Another mechanism that contributes to geographical variation in psychological characteristics is social influence. The conceptual basis of the social influence mechanism is essentially an extrapolation from experimental social psychology research showing that people’s thoughts, feelings, and behaviors are influenced by those around them. Although most of the evidence for social influence comes from experimental investigations, there is considerable evidence contagion effects within large social networks (e.g., Bourgeois & Bowen, 2001; Fowler & Christakis, 2008). For instance, results from the Framingham Study shows that positive affect spreads through social relationships. More specifically, one’s levels of happiness can be predicted by the happiness level of friends three times removed (Fowler & Christakis, 2008). A third mechanism that could give rise to geographical variation in psychological characteristics is ecological influence. Ecological influence is based on the assumption that aspects of the physical environment influence behavior. More specifically, there is empirical evidence suggesting that temperature, rainfall, green space, crowding, and pathogen prevalence can significantly influence many aspects of human behavior, which over time, can influence the thoughts, feelings, and values of people in the area. As such, the physical environment can influence the prevalence of particular psychological traits. One example of ecological influence comes from work by Schaller and colleagues, which suggests that national levels of Openness and Extraversion are low in parts of the world that have had historically high levels of infectious disease (Schaller, 2006; Schaller & Duncan, 2007; Schaller & Murray, 2008). The explanation for the associations is the high risk of spreading disease led people to become more closed off, skeptical, and exclusive, so that traits associated with these qualities were reinforced. Another example comes from work by Oishi, Talhelm, and Lee (2015), which suggests that there is a link between geographical terrain and well-being. Specifically, people high in Extraversion appear to show a strong preference for oceans whereas people low in the trait show a stronger preference for mountains. Moreover, people appear more content when in their preferred environments. The explanation for the link is that the ocean side is more conducive to socializing, which is desirable among extraverts, whereas mountains are more conducive to reflection, which is more desirable among introverts. Selective migration, social influence, and ecological influence are three mechanisms hypothesized to contribute to geographical variation in psychological characteristics. Although there is limited direct evidence that conclusively shows the impact that each mechanism has on geographical differences, there is a wealth of indirect evidence, which makes it reasonable to maintain the view that the mechanisms are important. It also seems highly likely that the mechanisms do not work independently but in combination. One example of how the mechanisms might work in combination to affect geographical variation in well-being comes from recent research on the psychological legacy of the Industrialization Revolution. Industrialization had far-reaching social and economic effects, especially in the old coal regions of Britain, where entire towns were built to mine the coal that fueled the factories. However, with technological advances and shifting economic structures, the value of coal plummeted, leaving entire populations unemployed. Today, the old coal regions continue to have high levels of unemployment and low income and rank near the bottom on measures of well-being (Obschonka et al., in press). To understand how the rise and fall of industrialization in coal regions influenced the well-being of residents in coal regions, Obschonka and colleagues (in press) examined the links between the historical employment share in large-scale coal-based industries and current levels of well-being. The findings suggested that the prevalence of coal-based industries was significantly related to high anxiety and depression, and low well-being. Analyses of the mechanisms responsible for these associations suggested that a combination of selective migration (with people high in well-being leaving the coal regions) and social influence (where persistent economic hardship restricted opportunities) played important roles. Thus far, we know how well-being differs across geographical areas and we have good ideas about the mechanisms that are responsible for the differences. But how important are geographical differences in well-being? Are they related to important outcomes? Investigating the links between geographical differences in well-being and various geographical indictors will not only inform our understanding of the importance of these differences, it will also help us understand how features of the environment contribute to well-being. Are Geographical Differences in Well-being Linked to Important Outcomes? To understand if geographical levels of well-being are associated with important outcomes, it is first useful to consider the processes through which psychological characteristics, such as subjective well-being, become expressed on geographic social indicators. There are at least two ways through which macro-level indicators of psychological characteristics and social indicators become linked. One way is through a “bottom-up” process, in which the psychological characteristics lead to demonstrative behaviors, which are then represented on conceptually relevant social indicators. This process implies that geographical differences in social indicators are an additive effect of the psychological characteristics of residents. Research on the behavioral manifestations of personality provides evidence for a bottom-up perspective (Bogg & Roberts, 2004; Ozer & Benet-Martínez, 2006; Roberts, Kuncel, Shiner, Caspi, & Goldberg, 2007). Another way psychological characteristics could become expressed in social indicators is through a “top-down” process, in which structural and institutional factors influence the prevalence of psychological and behavioral processes by shaping the experiences, opportunities, and expectations of residents. This process implies that geographical differences in psychological characteristics are a result of social and institutional differences. Support for this perspective comes from research in social and cultural psychology showing that norms influence people’s attitudes and behaviors (e.g., Cohen, 1996; Hofstede, 2001; Triandis & Suh, 2002). These processes are complementary and intended to provide insight into the ways in which psychological characteristics become represented on social indicators. To date, research on the geographical correlates of subjective well-being cannot pinpoint causality, so it is not possible to say that certain associations are due to bottom-up processes while others are based on top-down processes. Nonetheless, it is helpful to keep these processes in mind while interpreting the links between geographical levels of subjective well-being and the social indicators. National-level correlates of subjective well-being. To develop an understanding of why some nations consistently score highly in well-being, it is helpful to examine the cultural correlates of well-being. This approach has illuminated a number of important findings. Specifically, it appears that nations with high levels of well-being are have more individualistic cultures where citizens place considerable value on personal independence and autonomy (Diener, Oishi, & Lucas, 2003; Hofstede, 2001). One interpretation of the association is that individualistic societies, compared to collectivistic societies, afford people more opportunities to pursue personal interests and to express themselves, so people have a greater range of opportunities and sense of freedom. There is also evidence that nations with high levels of well-being score high on measures of human rights and social justice. These findings suggest that in nations where the rights of all citizens, irrespective of gender, race, ethnicity, or sexual orientation, the population as a whole is effectively able to enjoy the freedom to pursue a meaningful life. Several studies have observed positive associations between national levels of subjective well-being and median income, suggesting that residents of wealthy nations are more satisfied with their lives compared to people in less affluent nations (Diener et al., 2003; Diener & Suh, 1997; Easterlin, 1995; Schyns, 1998; Stevenson & Wolfers, 2013). The explanation for this association is that in wealthy nations, basic needs, like electricity, plumbing, shelter, healthcare, and the like are, are available, so life is much easier for residents than it is for people who live in nations where such needs are not easily met. Moreover, there is evidence that the benefits of national wealth to subjective well-being is greater to citizens of low-income nations than it is to residents of post-industrial and high-income nations (Mellander, Florida, & Rentfrow, 2011). Cross-cultural studies of personality have also added to our understanding of national differences in well-being. There is evidence that nations high in subjective well-being are also high in Extraversion, Agreeableness, and Openness, and Emotional Stability (McCrae & Terracciano et al., 2005, Steel & Ones, 2002). These patterns of associations are generally consistent with individual-level research and raising interesting ideas about the nature of national differences in well-being. One idea is that places where there are disproportionate numbers of sociable, enthusiastic, friendly, and stable people causes people to feel accepted, appreciated, and hence satisfied with their lives. Another idea is that cultural characteristics, like individualism-collectivism, freedom, and social justice, interact with the personality traits with the people in the culture to affect subjective well-being. At present, we lack the data to understand precisely how culture, money, and personality interact to affect national variation in well-being. Regional-level correlates of subjective well-being. Analyses of the correlates of regional differences in well-being has identified a number of patterns of results that are consistent with nation-level analyses and also offer more nuanced information. Studies concerned with regional variation across the U.S. have shown that well-being is linked to a range of economic, occupational, social value, and personality indicators. Wealth is important for regional differences in well-being. Both states and counties that score high on measures of well-being also score high on various measures of wealth. Specifically, regional levels of well-being are related to median income, per capita GRP, and house prices (Florida, Mellander, & Rentfrow, 2013; Lucas et al., 2014; Rentfrow et al., 2009). However, the nature of the association between well-being and income does not appear to be linear, as money generates diminishing returns for well-being. That is, as regions become wealthier the benefits to well-being become marginal at best. Given the strong association between wealth and well-being, it is customary for researchers to control for the effects of wealth on well-being. Regional differences in well-being are also related to many occupational indicators. Areas with large proportions of educated and employed residents show high levels of well-being. There is also evidence that regions with large shares of highly educated professionals- or what Florida (2002) refers to as the creative class, also score highly in well-being. These patterns are consistent with the proportion of residents who have working-class professions (i.e., construction and extraction, installation, maintenance and repair, production, transportation and material moving occupations). Regions with comparatively large shares of working class professions score low on well-being. Just as nations that value freedom and tolerance score high in well-being, so too do states regions. Indeed, Rentfrow et al. (2009) observed evidence that states with large amounts of social and cultural diversity also score highly on measures of well-being. However, it is necessary to point out that these results were not replicated at the county level (Lawless & Lucas, 2011; Lucas, Cheung, & Lawless, 2014). In fact, it appeared that at the county level, sexual orientation and ethnicity were negatively related to well-being. Statewide differences in well-being are also linked to personality. Specifically, states that score high in subjective well-being also score highly on Neuroticism, which is consistent with research at both the individual and national levels of analysis (Lyubomirsky et al., 2005; Steel & Ones, 2002). In their analyses of well-being across counties, Lawless and Lucas (2011) observed associations between well-being and the prevalence of married couples. Specifically, areas with large proportions of married couples were significantly higher in well-being, whereas the prevalence of residents who were separated, divorced, widowed, and single were each associated with significantly low levels of well-being. This pattern of results is consistent with research at the individual level (Ben-Zur & Michael, 2009; Gove, Style & Hughes, 1990), and the results lend further support to the argument that social relationships are very important for subjective well-being (Diener & Seligman, 2002). It may not come as a surprise, but it is important to report that regional variation in subjective well-being is also related to several physical health indicators (Lawless & Lucas, 2011). Specifically, the level of well-being in U.S. counties is significantly related to rates of physical health, obesity, and deaths due to cancer, heart disease, influenza, homicide, and others. These results hold even when the rates are adjusted for age. Thus, it appears that regions where disproportionate numbers of people are physically unhealthy are also places where subjective well-being is low. Another aspect of research in this area concerns the impact that regional psychological characteristics have on the social and psychological processes of individuals. Studies of geographical variation can help us understand how social and physical aspects of the environment influence and interact with various psychological processes and affect subjective well-being. One of the ways research in this area can add to our understanding is by illuminating the choices people make about where to live and whether those choices influence their well-being. What factors do individuals seek out when choosing places to live, and do those choices relate to life satisfaction? Using data from a Gallup Poll of Americans, Florida (2008) examined the factors that influence people’s decisions about where to live. For some people, social relationships are very important and provide a strong source of life satisfaction. Such people therefore rank proximity to friends and family among the most important factors when deciding where to live. Other people derive a great sense of meaning from their careers and structure their lives around work. For people who place such importance on their careers, proximity to work ranks higher than living near loved ones. And for other people, a significant source of pleasure in life comes from spending time in various cultural or natural spaces. For that reason, some people place outdoor amenities, like access to trails, parks, or beaches highly, or urban amenities, like museums, clubs, and restaurants highly. The fact that there are individual differences in place preferences is not surprising, but does living somewhere that satisfies one’s preferences promote subjective well-being? To live in a place that offers opportunities to pursue one’s interests seems ideal, and it seems reasonable to expect that living in such a place would contribute to well-being. For instance, living in a suburban area with quiet streets, good schools, and plenty of green space should enhance well-being for people who value raising a family because such areas provide supportive environments fulfilling that goal. In contrast, living in a big city with famous museums, galleries, and theaters should enhance well-being for people who value cultural experiences because such areas are well equipped to provide them. There is empirical evidence to support such reasoning. Specifically, in a large-scale of 216 London neighborhoods, Jokela, Bleidorn, Lamb, Gosling, and Rentfrow (2015) examined whether subjective well-being is associated with living in a neighborhood that has characteristics that complement people’s personalities. The findings indicated that the degree to which personality and place characteristics complement each other does influence well-being. Specifically, the findings showed that people high in Openness had high subjective well-being if they lived in densely populated and culturally diverse parts of London, and that people high in Agreeableness had high subjective well-being if they lived in neighborhoods with large numbers of family-occupied homes, large gardens and parks, and low crime rates. These results suggest that there may not be a single set of environmental factors that enhance well-being (once basic needs are met), but instead that environmental factors differentially affect well-being depending on certain personality traits. Another way to conceptualize person-environment interactions on well-being is to consider the degree to which people are psychologically similar to the people in their environment. It is abundantly clear that loneliness and isolation have serious consequences for psychological and mental health, so it is not surprising that feelings of belongingness are critical for self-esteem and contribute to subjective well-being (Leary & Baumeister, 2000). Feeling a sense of belonging and connection to others facilitates the development of a shared reality where people’s thoughts, values, and emotions are validated, which can contribute to feelings of self-worth (Fulmer et al., 2010). Thus, we can consider the degree to which people are psychologically similar to their neighbors as measure of person-environment fit, and examine whether the degree to which people fit with their neighbors is linked to well-being. Bleidorn et al. (2016) investigated this possibility by studying personality similarity between individuals and the modal personality of the people living in their city. The results from their analyses small but statistically significant fit effects on self-esteem. Specifically, the more similar people were to their city’s modal levels of Openness, Agreeableness, and Conscientiousness, the higher was their self-esteem. Although small effects, the results nevertheless suggest that people have a greater sense of self-worth when they share with their neighbors similar levels of curiosity, friendliness, and self-discipline. Sharing similar values to one’s neighbors is also important for well-being. As the level of political polarization dividing regions of the U.S. increases, people are sorting themselves into areas where they will be surrounded by others who share their beliefs. Indeed, regional differences in political ideology are partially driven by people’s efforts to share spaces with like-minded others. And the evidence indicates that living with others who have similar ideologies fosters a sense of belonging and group identity (Dixon & Durrheim, 2003; McPherson, Smith-Lovin, & Cook, 2006). For instance, in an impressive series of studies, Motyl, Iyer, Oishi, Trawalter, & Nosek (2014) investigated the consequences of ideological fit within a regional context and found that ideological fit was linked to feelings of belonging, place satisfaction, and the desire to stay in the area. In contrast, people who did not share political or religious values with their neighbors were more likely to want to move and to actually move to another location. In summary, the social and physical characteristics of places are important to subjective well-being. Whether or not people live in areas that satisfy their needs and have neighbors who share their values and beliefs is important for subjective well-being. Research in this area offers important insights for understanding the complex factors that contribute to well-being and they also have implications for researchers and policy makers concerned with developing programs and initiatives designed to promote psychological well-being. However, it is important to acknowledge that all the research that has focused on geographical variation in well-being is based on samples from predominantly WEIRD nations (white, educated, industrialized, rich, and democratic). The fact is that people in many parts of the world, and in industrialized nations, lack the opportunities or resources to choose where they live. This fact is a limitation of the research and its implications. Where we live matters: So many important events and all the seemingly trivial routines of daily life occur in the communities, towns, cities, and states in which we live. These are the places where we learn about who we are and what we believe. And finding the right place to live is among the most important life decisions that people make. It should therefore come as little surprise that the study of geographical differences has a lot to contribute to our understanding of subjective well-being. The research carried out thus far provides several important insights about the nature of well-being and offers valuable clues about the social and economic factors that might enhance it. Further investigating the scale and impact that geographical factors have on individual-level subjective well-being has the potential to inform theory and research in psychology, as well as government and policy initiatives aimed at promoting healthy living. Ben-Zur, H., & Michael, K. (2009). Social comparisons and well-being following widowhood and divorce. Death Studies, 33(3), 220-238. Bleidorn, W., Schönbrodt, F., Gebauer, J. E., Rentfrow, P. J., Potter, J., & Gosling, S. D. (2016). To live among like-minded others: Exploring the links between person-city personality fit and self-esteem. Psychological Science, 27(3), 419-427. Bogg, T. & Roberts, B. W. (2004). Conscientiousness and health behaviors: A meta-analysis. Psychological Bulletin, 130, 887-919. Borhani, N.E. (1965). Changes and geographic distribution of mortality from cerebrovascular disease. American Journal of Public Health, 55, 673-681. Bourgeois, M. J., & Bowen, A. (2001). Self-organization of alcohol-related attitudes and beliefs in a campus housing complex: An initial investigation. Health Psychology, 20(6), 434. Buss, D. M. (1987). Selection, evocation, and manipulation. Journal of Personality and Social Psychology, 53, 1214–1221. Cohen, D. (1996). Law, social policy, and violence: The impact of regional cultures. Journal of Personality and Social Psychology, 70(5), 961. Diener, E. (2000). Subjective well-being: The science of happiness, and a proposal for a national index. American Psychologist, 55, 34-43. Diener, E., Helliwell, J. F., & Kahneman, D. (Eds.) (2010). International differences in well-being. New York: Oxford University Press. Diener, E., Lucas, R. E., Schimmack, U., & Helliwell, J. (2009). Well-being for public policy. Oxford University Press, USA. Diener, E., Oishi, S., & Lucas, R. E. (2003). Personality, culture, and subjective well-being: Emotional and cognitive evaluations of life. Annual Review of Psychology, 54, 403-425. Diener, E., & Seligman, M. E. (2002). Very happy people. Psychological Science, 13, 81-84. Diener, E., & Suh, E. (1997). Measuring quality of life: Economic, social, and subjective indicators. Social Indicators Research, 40, 189-216. Dixon, J., & Durrheim, K. (2003). Contact and the ecology of racial division: Some varieties of informal segregation. British Journal of Social Psychology, 42(1), 1-23. Easterlin, R. A. (1995). Will raising the income of all increase the happiness of all? Journal of Economic Behavior and Organization, 27, 35–47. Florida, R. (2002). The rise of the creative class: And how it’s transforming work, leisure. New York: Basic Books. Florida, R. (2008). Who’s your city? : How the creative economy is making where to live the most. New York: Basic Books. Florida, R., Mellander, C., & Rentfrow, P. J. (2013). The happiness of cities. Regional Studies, 47, 613-627. Fowler, J. H., & Christakis, N. A. (2008). Dynamic spread of happiness in a large social network: Longitudinal analysis over 20 years in the Framingham Heart Study. British Medical Journal, 337, a2338. Glymour, M. M., Avendaño, M., & Berkman, L. F. (2007). Is the ‘Stroke Belt’ worn from childhood? Risk of first stroke and state of residence in childhood and adulthood. Stroke, 38, 2415-2421. Gove, W. R., Style, C. B., & Hughes, M. (1990). The effect of marriage on the well-being of adults: A theoretical analysis. Journal of Family Issues, 11(1), 4-35. Heppen, J. (2003). Racial and social diversity and U.S. Presidential election regions. The Professional Geographer, 55, 191–205. Hero, R. F. (1998). Faces of inequality: Social diversity in American politics. New York: Oxford University Press. Hofstede, G. (2001). Culture's consequences: Comparing values, behaviors, institutions, and organizations across nations (2nd ed.). Thousand Oaks, CA: Sage. Inglehart, R., & Klingemann, H. (2000). Genes, culture, democracy, and happiness. In E. Diener and E. M. Suh (Eds. ), Culture and subjective well-being (pp. 165–183). Cambridge, MA: The MIT Press. Jokela, M., Bleidorn, W., Lamb, M. E., Gosling, S. D., & Rentfrow, P. J. (2015). Geographically varying associations between personality and life satisfaction in the London metropolitan area. Proceedings of the National Academy of Sciences, 112, 725-730. Krugman, P. (1991). Increasing returns and economic geography. Journal of Political Economy, 99, 483-499. Lanska, D. J. (1993). Geographic distribution of stroke mortality in the United States: 1939-1941 to 1979-1981. Neurology, 43, 1839-1851. Leary, M. R., & Baumeister, R. F. (2000). The nature and function of self-esteem: Sociometer theory. In M. P. Zanna (Ed. ), Advances in experimental social psychology (Vol. 32, pp. 1– 62). New York: Academic Press. Lucas, R. E., Cheung, F., & Lawless, N. M. (2014). Investigating the subjective well-being of U.S. regions. In P. J. Rentfrow (Ed. ), Geographical psychology: Exploring the interaction of environment and behavior. Washington, DC: American Psychological Association. Lynn, M., & Steel, P. (2006). National differences in subjective well-being: The interactive effects of extraversion and neuroticism. Journal of Happiness Studies, 7, 155-165. Martin, R. (1999). Critical survey. The new “'geographical turn” in economics: Some critical reflections. Cambridge Journal of Economics, 23, 65-91. Mellander, C., Florida, R., & Rentfrow, J. (2011). The creative class, post-industrialism and the happiness of nations. Cambridge Journal of Regions, Economy and Society, 5, 31-43. Motyl, M., Iyer, R., Oishi, S., Trawalter, S., & Nosek, B. A. (2014). How ideological migration geographically segregates groups. Journal of Experimental Social Psychology, 51, 1-14. Obschonka, M., Stuetzer, M., Rentfrow, P. J., Shaw-Taylor, L., Satchell, M., Silbereisen, R. K., Potter, J., & Gosling, S. D. (in press). In the shadow of coal: How large-scale industries contributed to regional personality and well-being differences. Journal of Personality and Social Psychology. Oishi, S. (2010). The psychology of residential mobility: Implications for the self, social relationships, and well-being. Perspectives on Psychological Science, 5(1), 5-21. Oishi, S., Miao, F. F., Koo, M., Kisling, J., & Ratliff, K. A. (2012). Residential mobility breeds familiarity-seeking. Journal of Personality and Social Psychology, 102(1), 149. Oishi, S., & Schimmack, U. (2010). Residential mobility, well-being, and mortality. Journal of Personality and Social Psychology, 98(6), 980. Oswald, A., & Wu, S. (2010). Objective confirmation of subjective measures of human well-being: Evidence from the USA. Science, 327(5965), 576. Rentfrow, P. J. (2011). The open city. In A. E. Andersson, D. Andersson, and C. Mellander (Eds.). Handbook of cities and creativity (pp. 117-127). London: Elgar. Rentfrow, P. J. (Ed.) (2014). Geographical psychology: Exploring the interaction of environment and behavior. Washington, DC: American Psychological Association. Rentfrow, P. J., Mellander, C., & Florida, R. (2009). Happy states of America: A state-level analysis of psychological, economic, and social well-being. Journal of Research in Personality, 43, 1073-1082. Schaller, M. (2006). Parasites, behavioral defenses, and the social psychological mechanisms through which cultures are evoked. Psychological Inquiry, 17, 96-137. Schaller, M., & Duncan, L. A. (2007). The behavioral immune system: Its evolution and social psychological implications. In J. P. Forgas, M. G. Haselton, & W. von Hippel (Eds. ), Evolution and the social mind: Evolutionary psychology and social cognition (pp. 293-307). New York: Psychology Press. Schyns, P. (1998). Crossnational differences in happiness: Economic and cultural factors explored. Social Indicators Research, 43, 3–26. Steel, P., & Ones, D. S. (2002). Personality and happiness: A national-level analysis. Journal of Personality and Social Psychology, 83, 767-781. Stevenson, B., & Wolfers, J. (2013). Subjective well-being and income: Is there any evidence of satiation?. The American Economic Review, 103(3), 598-604. Triandis, H. C., & Suh, E. M. (2002). Cultural influences on personality. Annual Review of Psychology, 53, 133-160. Veenhoven, R. (1993). Happiness in nations: Subjective appreciation of life in 56 nations 1946 –1992. Rotterdam, the Netherlands: Risbo.